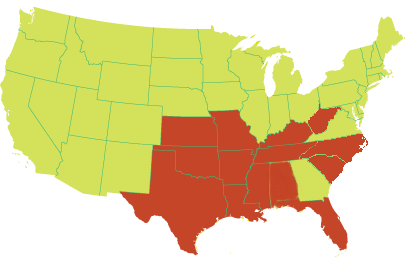 CONSTRUCTION NETWORK, INC. is licensed to work in all the orange-shaded states. These are Arkansas, Oklahoma, Texas, Louisiana, Missouri, Kansas, Tennessee, Kentucky, Mississippi, Florida, West Virginia, North Carolina, South Carolina and Alabama. We are pursuing licenses in other states and will update when we are coming to your area.